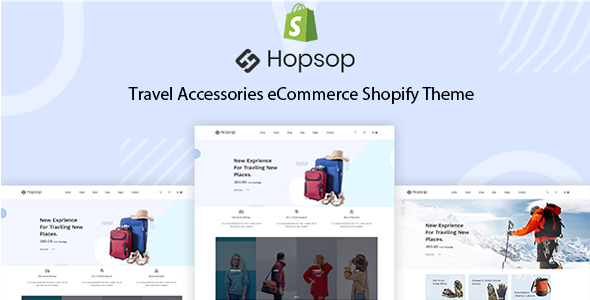 Hopsop – Travel Accessories eCommerce Shopify Theme is a responsive, functional, and great Travel Store Shopify Theme. This travel gear Shopify theme is specially designed so that you can easily sell all kinds of traveling accessories, outdoor equipment, tracking & hiking tools, and backpacking gear. Moreover, Hopsop eCommerce Shopify theme is built-in Shopify Sections, using powerful drag & drop page builder. This modern design is established to easily organize your work, using eCommerce plugins. On the other hand, customization of the robust design is very easy and responsive page layouts will give you freedom of choice. With Hopsop, astoundingly present your travel kits, accessories, gear and equipment in a collection of different important categories and filters. In this case, the large full-width slider on the front page will serve you as a great promotional tool and beautiful banners will help you in showing off your latest product collections, shopping products, featured products, and great discounts. However, there are two unique Home Versions, and along with a page on About, Shop, Blog, Product, and Contact. The feature-rich Hopsop ensures the utmost flexibility. It provides Mega Menu with Images, Drop-down Menu, Latest Blog, Add to Cart, Wishlist, Ajax Search, Quick Links, My Account, Checkout, Login, Services, Google Fonts, Google Contact Map, Contact Form, Online Payment, Multi-currency, and plenty more. Consequently, the premium Hopsop theme is the best fit for you whether you run a Traveling Agency and Adventure & Ride Company, or a Travel Blog. With this cross-browser compatible theme, you will be able to set up your perfectly functional online store and attract your viewers’ attention. Try Hopsop – Travel Accessories eCommerce Shopify Theme now!